With the exception of At the BBC (also called At the Beeb), consisting of recordings from 1973, there hardly had been any live documents by Queen from the pre-Live Killers era. Most of the Queen live albums (Live at Wembley ’86, Queen on Fire, Queen Rock Montreal, Hungarian Rhapsody) go back to the period between 1982 and 1986 — in other words, there hasn’t been any official releases documenting Queen’s live work before and during the “Bohemian Rhapsody” years. At last, that oversight has been finally corrected in glorious fashion with the release of Live at the Rainbow ’74, which chronicles a then-rising band performing two shows at the Rainbow – one from March 1974 as part of the Queen II tour, and then a few months later in November for the Sheer Heart Attack tour. (The DVD show features the entire November show in its entirety and a few bonus songs from the March performance). The new set debuts many songs that hadn’t see the light of day in their live incarnations – maybe except through fan bootlegs: “Father to Son,” “The March of the Black Queen,” “In the Lap of the Gods,” “Flick of the Wrist,” “White Queen,” “Bring Back That Leroy Brown” and “Stone Cold Crazy.” Live at the Rainbow ’74 will be an ear-opener for younger fans who only knew the original studio versions, such as: Freddie Mercury singing the lead part in “Modern Times Rock and Roll,” which was originally done by Roger Taylor; the first half of “Killer Queen” segueing into “The March of the Black Queen”; or the band diving into rare cover song territory with renditions of “Jailhouse Rock” and “Big Spender.” The performances, especially on the DVD version, really capture the band members in their glam rock phase, decked out in their stylish Zandra Rhodes attire – Mercury is seen with long hair, black fingernails, and a glittery glove, long before sporting that iconic mustache. You just knew based on the Rainbow performances that the band was destined to play the massive arenas underneath the ‘pizza’ lights, which Queen eventually did all over the world. 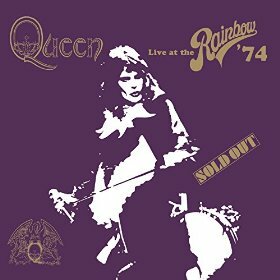 For the die-hard fan, Live at the Rainbow ’74 is a major revelation, and it hopefully marks the start of more archival live music from 1973-1978 to be released. Also available on CD and vinyl.